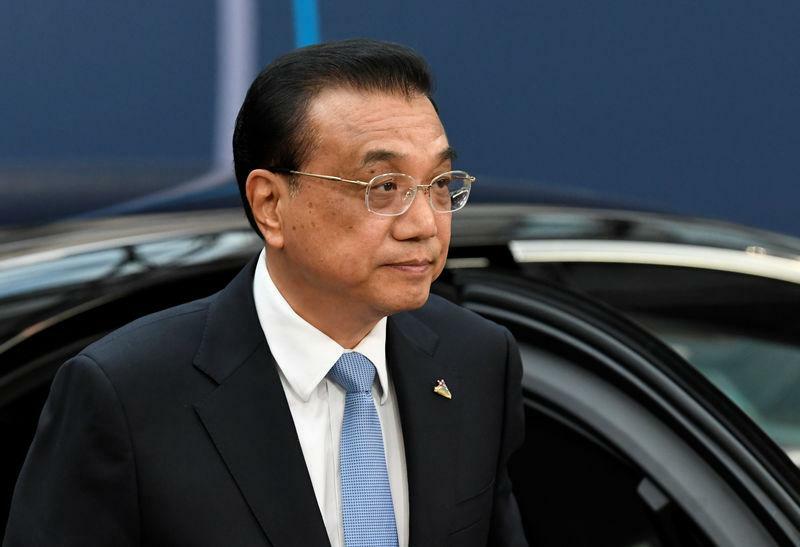 BEIJING (Reuters) - Chinese Premier Li Keqiang said at a meeting between Asian and European leaders in Brussels that China will continue to open up its economy, push forward reforms and improve its business environment, the official Xinhua News Agency reported on Saturday. Li said Asian and European countries need to safeguard multilateralism and the rules-based free trade system, Xinhua reported. China is in the midst of a worsening trade war with the United States, with U.S. President Donald Trump demanding sweeping changes to China's intellectual property, industrial subsidy and trade policies. Brussels shares Washington's concern about China's trade practices, but differs with the U.S. on how to force Chinese reform. Li said that China's economy is healthy but is facing challenges including changes to the external environment. He said China will continue to move toward a market-oriented exchange rate, will not engage in competitive devaluation, and that the yuan can remain basically stable at a reasonable level. The Chinese premier said he supports improvements to the rules of the World Trade Organization (WTO), but that changes must be carried out on the basis of the WTO's existing rules and the interests of developing countries must be respected, Xinhua reported.